We ship primarily with EMS. Delivery requires the recipient's signature. If delivery is to a different person than the one ordering, please specify the recipient's shipping name and address. If paying with a credit card, the recipient's name cannot be different from the payer’s name (for security reasons). Delivery to P.O. Boxes is NOT possible under this service. To get exact shipping cost, either for combined items, eBay® items, or for specific destinations, please use the utility above. Use the total weight of your order as obtained for each item from Pricelist. A fixed lower postage of only €10.00 is available thru regular post office service for nearly any destination but delivery time is about 5 days (for EU member states), 10 days (for USA/Canada/Non-EU Europe/Japan/Australia), or up to 1 month (for other parts of the world) and there is no tracking capability. For most destinations, delivery to P.O. Boxes is possible under this service. For software products delivered via regular mail, there is a €10.00 flat surcharge per order for copying, shipping and handling. There is no surcharge for software delivered electronically via e-mail (when ordering, you must supply personal e-mail address and explicitly mention you wish e-mail delivery). We normally ship within a day or two of receipt of payment. Occasionally, mostly due to circumstances beyond our control (e.g., unable to obtain credit card approval), your order may be delayed a couple more days. You will be notified if that is the case. You can calculate the shipping & handling cost yourself by downloading the little utility above, plugging in your order’s total weight, and selecting your location from the list of countries. (Note: Some areas may be offered only under a specific courier service, so if you don't see your country in the list, try a different service). To find the total weight of your order use the weights listed for each product on the Pricelist page. To enter grams, use the decimal point (e.g., type 0.35 for 350 grams or 35 for 35 Kilograms). To select a shipping destination, press ESC and then select your area from the list. Press ENTER or click to accept. 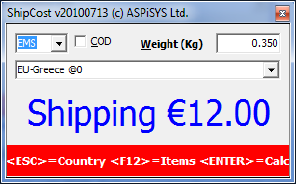 The selected shipping area is constantly displayed. While the country list is displayed, you can type the first few letters of your country to quickly locate it within the list and then press the down arrow followed by ENTER or click to accept. Note: All EU member country names start with EU- (e.g., EU-Italy). The @number shown next to your country is a rough approximation of the number of days required for delivery to you. At times, we experience unusually high quantities of concurrent orders to be processed. To better process all orders during such periods, we may have to ship all orders completed during a whole week on the immediately following Monday. Download and run the program above. This is now a pure Windows application (no .NET required). This application is subject to change without notice, either to improve its functionality, correct possible errors, or update pricing information. Make sure you only use the latest version published on this page to get correct pricing.